S. D. Malkin Properties has secured $155 mil in construction financing for the ground-up development of two oceanfront hotels in Oceanside. The loans were arranged by HFF and placed with Bank OZK and an East Coast-based institutional investor. The two hotels will be developed over a 2.75-acre, two-block site located along Mission Ave and North Pacific St. Both properties will have immediate access to the beach and, combined, feature 387 rooms, 85% of which will have water views. The hotels’ location in Oceanside places it central to several of Southern California’s most famous attractions, including Disneyland, Legoland, Sea World and the San Diego Zoo. One of the hotels will be operated by Destination Resorts and the other by Joie de Vivre (both brands are owned by Hyatt). The hotel operated by Destination Resort will have 226 rooms, a signature restaurant, indoor/outdoor lounge, pool with ocean views, luxury spa and more than 20,000 square feet of meeting and event space. The hotel operated by Joie de Vivre hotel will have 161 guest rooms, a rooftop pool and bar, world class restaurant, public garden and 3k sf of retail space. It will feature the historic circa 1887 Graves House, a local icon commonly known as the “Top Gun” house, which will be completely renovated and opened to the public. HFF’s Timothy Wright, Scott Hall, Olga Walsh and Aaron Lapping arranged the financing. 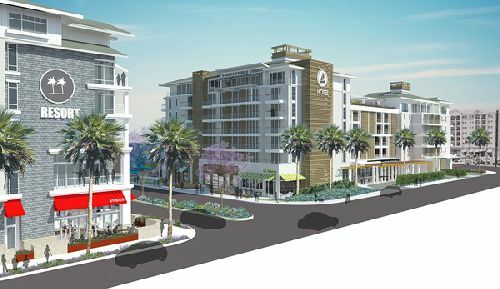 According to Wright, the beachfront hotels will be distinctive but complementary, providing a full-service and boutique experience in downtown Oceanside’s burgeoning retail, restaurant and entertainment district.